It was exactly a year ago when additional NRC inspectors were at the Davis-Besse nuclear power plant to closely monitor and follow the installation of the new reactor vessel head. The plant had been shut down since October 1. The NRC reviews and inspections had already begun in July 2011 to verify the new head was made to NRC standards and requirements. On October 10, workers were cutting a hole in the side of the outermost building to replace the reactor head when they found a crack in the reinforced concrete. 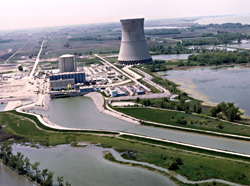 The NRC took immediate action by having the inspectors who were already at the plant follow the discovery, by sending a concrete material expert to the plant the same day to better understand the technical issue and by forming a special technical review team in response to the discovery. The review team was tasked with ensuring a thorough and rigorous review of the issue to determine if the plant could still be operated safely. The NRC conducted more than 1,200 hours of inspections in response to this discovery and held public meetings in the area to discuss the issue and answer questions from the public. The plant now has a new reactor head on and is currently operating safely. Some of the actions the NRC took and how the agency responded can be seen in a new YouTube video. In the video, we take you inside Davis-Besse with some of the NRC inspectors who were involved in the inspections of the new head installation and the shield building. We hope you take a few minutes to check it out. I’m afraid, then, you won’t be able to see the video, but you can read about the situation here: http://www.nrc.gov/info-finder/reactor/davi.html . oh, youtube has been blocked in our country, so how can I access these videos?